Gay cruising does not have to be on a big ship why not ... Charter a Gay Friendly Yacht and Sail the Caribbean Islands of St Croix, Saint Martin and Saba! Are you interested in gay cruising to friendly sailing destinations? Where you can relax aboard a charter yacht and just be yourself and feel comfortable! Imagine a dream vacation with your partner - turquoise blue waters teeming with breathtaking reef fish, balmy tropical breezes, swaying tropical palm trees over white sand beaches, and seemingly endless sunsets that set the sky afire. Dreaming can become a reality with captained/crewed Caribbean gay cruising sailboat charters. All the work is done for you, including gourmet meal preparation, if you so desire. Your job is simply to decide how to relax! Gail Hartman, will gladly help with these arrangements. 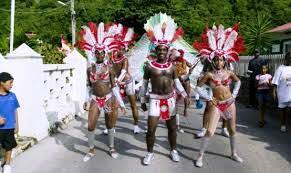 Just as the islands themselves differ, attitudes towards homosexuality in the Caribbean vary from place to place. 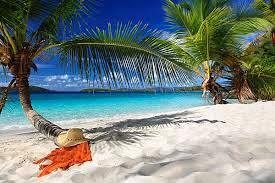 Several web sites on gay cruising and lesbian travel can provide assistance; however, three islands that are particularly friendly to the gay traveller are St. Croix, Saint Martin, and Saba. St. Croix lays 35 miles south of St. Thomas and is the largest of the US Virgin Islands. A visit to this island can be part of a gay cruising sailing adventure in the Caribbean by charter yacht, but allow at least 4 extra days - a day to sail there, 2 days to sightsee, and a day to sail back. St. Croix is vastly different from St. Thomas. The landscape changes dramatically from rocky sierras, fertile coastal plains, and lush rainforests to picturesque beaches. The two major towns are Christiansted, on the northeast coast, and Frederiksted on the west coast. The early Dutch influence on Christiansted is still highly visible through its original architecture, dating from the 1700's, cool arcades, and Danish street signs. Besides many historical sites, the downtown has wonderful shops, especially if you are in the market for "Crucian" bracelets and other local art - all tax-free. Many wonderful restaurants are tucked among the shops. Although St. Croix is not known for its crazy nightlife, Christiansted has many options. Cover charges do not exist, so you can easily check out the scene. Most places have live music ranging from jazz to rock to reggae to steel drums. If you are in the mood for something more sophisticated, check out the Pink Fancy. This cute and well-kept gay friendly historic inn has been a favourite hangout for stage stars like Noel Coward since the 1950's. No steel drums here - patrons listen to opera and classical music in the courtyard. If you are looking for more adventure, Buck Island, about 4 ½ miles off of Christiansted, offers fabulous water sports and beach activities. The Buck Island National Monument is an 850 acre paradise of white sand beaches, crystal clear water, barrier reefs, hiking trails, and 2 well-marked snorkelling trails. Some of the best displays of colourful tropical fish floating around coral shelves can be found here! As you travel around St. Croix, there are many beautiful beaches and picnic areas, as well as historic sites to visit. The St. George Village Botanical Gardens is a restored sugar plantation worth seeing because of the gardens filled with plants and flowers indigenous to St. Croix. The Cruzan Rum Distillery is located on the southwest coast. You can visit the distillery and watch the workers making rum. A tasting bar concocts a new rum drink daily. Heading towards Frederiksted is the rainforest with a 150-foot dam. Mahogany Road is lined with magnificent mahogany, yellow cedar and Tibet trees. Local wood carvers and sculptors sell their wares, or you can arrange for custom work to be shipped to you. Frederiksted, located on the west coast, is a rather sleepy for those gay cruising its a friendly place. Cormorant Beach, a beautiful stretch of white sand, is home to the Sand Castle on the Beach Resort. 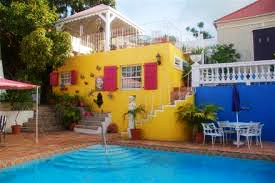 This relaxed tropical setting has been hosting the gay and lesbian community since the 1970's. The hotel's Beachfront Café is rumoured to have the best lunch in town. If you are looking for a destination vacation, perhaps the gay-friendliest islands in the Caribbean are the islands of Saint Martin and Saba. 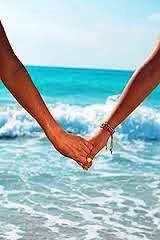 Both can be visited on a captained/crewed Caribbean sailboat charters, an intermit way to experience gay cruising. Shared by the Dutch and French, the island of Saint Maarten/Saint Martin is a haven for shopping, sunbathing, gourmet dining, and gambling. There is plenty to see and do for the gay visitor. Philipsburg and Margot are the largest towns on the Dutch and French sides, respectively, and they both offer plenty of opportunities to shop, eat, or have a lively night out. There are also numerous beaches that those that are gay cruising can visit (some clothing optional) on both sides where you can enjoy snorkelling and scuba diving. The heavily developed town of Philipsburg is the main draw for shoppers on the Dutch side. Duty-free shops sell everything including: alcohol, cigars, jewellery, cosmetics, perfume, clothes and food, of all varieties. The best nightlife, in terms of bars and nightclubs, is also on the Dutch side. For partygoers, there is something happening every might. One particularly gay cruising hot spot, especially on Thursdays, is Bliss - a hip, lively nightclub with international DJs making regular appearances. Decorated with oversized four-poster beds, Bedouin tents and throw pillows, things pickup around midnight and continue to dawn. After a late night, the perfect day can be spent beach hopping outside of Philipsburg. The vast Simpson Bay lagoon dominates the Dutch side and is a popular spot for water sports. Heading west, a series of white sand beaches dot the Dutch side. Airplanes swoop over Maho Beach into Julianna Airport and the Sunset Beach Bar is one of the most packed spots when the sun goes down. Mullet Bay is often the most popular beach with its gentle surf and white sugary sand. A dramatic, yet quiet beach is Cupecoy with its sandstone cliffs and caves. This beach is clothing optional. Although there are secluded gay-only coves, most gay visitors just share the main section of the beach with everyone else. 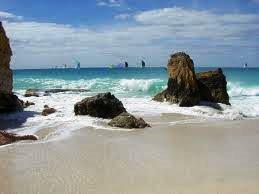 French Saint Martin is less commercialized than the Dutch side, despite having some of finest beaches and restaurants and the more attractive scenery. The French town of Marigot is more a combination of Europe and Caribbean culture than its Dutch counterpart in Philipsburg. The morning fruit and vegetable markets in the quay are a colourful explosion of Southern French and Caribbean offerings. The pace on the French side of the island is much slower. Numerous street side cafes, bars and restaurants encourage visitors to relax over expresso and patisserie or dine on delicious Caribbean fare as French is spoken all around you. The elegant shops and chic boutiques are reminiscent of those in Paris. For nightlife, the only gay bar on the island, L'Alibi, offers a friendly, diverse crowd, although it usually does not heat up until late. Kali's Beach Bar holds a monthly full moon party for its gay patrons. Leaving Marigot, the interior countryside remains unspoiled and peaceful, and offers many opportunities for gay cruising on friendly Caribbean sailboat charters to enjoy non-water activities. The Loterie Farm is a nature lover's delight. This former sugar estate is now a 150-acre working farm with carved out eco-trails that lead to a forest of giant silk cotton trees, as well as mango and palm groves fed by quiet streams. If you have a lot of energy, you can take the 3-hour hike to the top of Pic Paradis, the island's highest point. Trails will take you through fields of bananas, melons and papayas, to the densely wooded peak alive with colourful tropical birds. After building up a hearty appetite, you will want to stop in the little town of Grand Case with some of the finest dining in the Eastern Caribbean. Evening specials are listed on chalk boards outside each establishment. Although most restaurants will take credit cards, you will often get a better deal by paying cash for your meal. The little main street is lined with dozens of gourmet restaurants and not much else. It is worthwhile, however, to stop in the small art gallery. Local artist Asif Hake delicately depicts the beauty of this island in his reasonably priced paintings. They can be a nice memory of your time on the island. Continuing towards the rough Atlantic shores of the east coast, the Butterfly Farm has a fascinating collection of beautiful species. The best time to come is in the morning when they are most active. Next door is a riding stable that offers beach rides. It is a thrilling experience to ride barefoot through the warm crystal clear blue water. At the north-eastern end of the island, is the popular 'clothing optional' Orient Beach - a fabulous swatch of white sand bordering an amazing turquoise blue sea. Whether you want to Jet Ski, windsurf, snorkel, or especially just people watch, on this gay cruising sailing vacation this beach is a great place to do it. 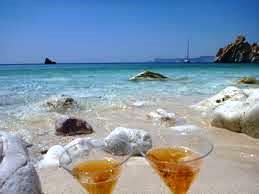 The beach is a mixture of the Club Orient (a naturist resort), a party beach, a family beach and everything in between. 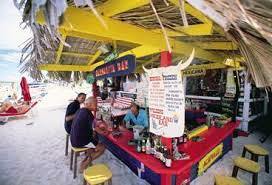 There are numerous restaurants and snack bars lining the beach, including the rainbow flag-flying Tiki Hut. Offshore, you will find the island of Tintamarre, which is famous for its mud baths. It is a fun place to spend the day. After exploring the hubbub of Saint Martin, sail over to the nearby island of Saba. Although most charter bases do not allow overnight anchorages anymore, Saba makes a great day trip for Caribbean gay cruising sailing charters. If you want to spend more time, take a ferry from St. Martin. Sparsely populated, and priding itself as the "Caribbean as it used to be," Saba 's great diving and hiking, more than compensate for the lack of beaches and tourism development. Saba 's population is around 1,500, of which 300 are students at the Saba University School of Medicine. Despite its tiny size, Saba is very gay friendly. 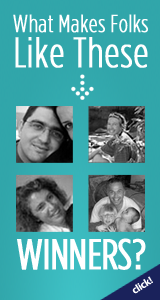 Four athletes were sent to the Gay Games in Sydney in 2002. The director of the Saba Tourist Bureau is gay. One of Saba's two doctors is a lesbian, and a gay couple owns the Westwardside restaurant YIIK. For the gay traveller seeking adventure or simply a quiet and unusual vacation, Saba is a friendly destination. This miniature volcanic island's rocky slopes climb steeply out of the sea rising to a high point of 2,885 feet. Rugged cliffs support 5 square miles of green mountainous terrain, dotted with 4 small villages of white cottages, red roofs and green shutters. Saba 's main village, The Bottom, stands on a small piece of flat land surrounded by mountains. The village functions as the island's capital. The hospital, school, a few bars, and a handful of munching goats surround the government building. Windwardside is the picturesque village base for hiking trips and home of the Saba Museum, a sea captain's house that was built in 1840. The most popular hike on the island is up the1,064 concrete steps to Mount Scenery. The path is easy to follow, but this 3 hour tour can be a tough climb. It is well worth the effort for the spectacular vistas of neighbouring islands and gorgeous tropical vegetation. At the summit, you will find giant mahogany trees covered in moss, bromeliads and ferns. Butterflies, hummingbirds, bananaquits and iguanas flit among the fauna. For a tiny island, Saba has a surprisingly variety of places to eat, especially in Windwardside. The local cuisine is heavily geared towards seafood. In terms of nightlife, however, unless you arrive during a festival, options are limited as most places close by 9:00 p.m. 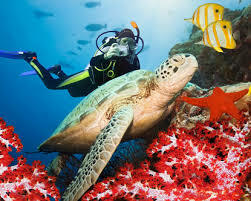 Superb diving is the reason most tourists and Caribbean sailboat charters make it to Saba. Since 1987, the waters and reefs around Saba have been protected as part of the Saba Marine Park. The volcanic activity that created Saba also created a spectacular underwater world rich in sea life. The 26 diving grounds provide divers of all levels with unbelievably beautiful spots to explore. There are slopping reefs, where stingrays cruise or nurse sharks sleep in the sand. A pillar of coral, called Needle's Eye is a unique collection of tube and barrel sponges, star coal, elephant ears and brain coral. At Third Encounter, an old underwater volcano rears up to just 100 feet below the surface. Another great place to explore is Tent Reef Wall encrusted with corals and sponges where many interesting creatures seek shelter. On your gay cruising sailing adventure of the Caribbean you’ll find it is a great vacation spot for the sun-loving traveller. With a captained/crewed Caribbean Sailboat Charters arranged through a broker, all the work is done for you. All you need to do is decide how you want to relax (or party!). Whether you choose a side trip to St. Croix from the USVI or BVI, or take a destination trip to the islands of Saint Martin and Saba, you will find a gay cruising environment with white sand beaches, fun nightlife, spectacular water activities and exciting land adventures. Donna Wolfson also known as "Sailgirl" at Virgin Island Sailing has been sailing in the Caribbean and writing about it for years. Learn more about Caribbean Sailboat Charters.